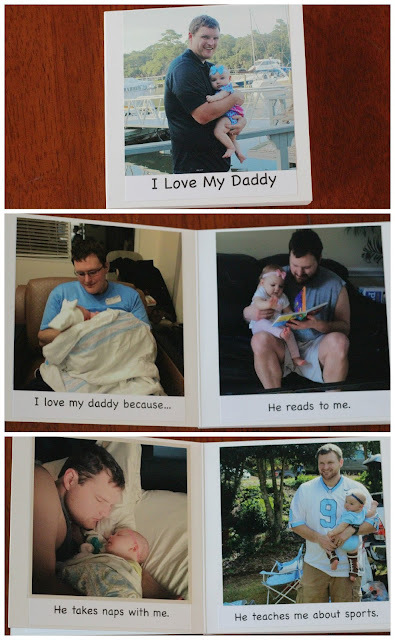 I wanted to share what Ella got her dad yesterday for Father's Day...a board book! My husband hates getting presents (I knowwww), but since this book is technically for Ella, he loved it! And Ella's favorite thing to do these days is read books with Daddy, so what better than to read a book about Daddy?! It was super to easy to make! At first, I typed out the words on photo paper, but they smudged almost instantly. 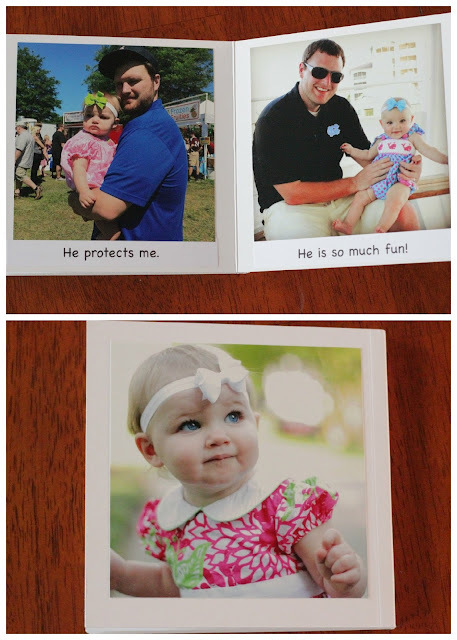 So I printed them a second time onto card stock and that was much better! 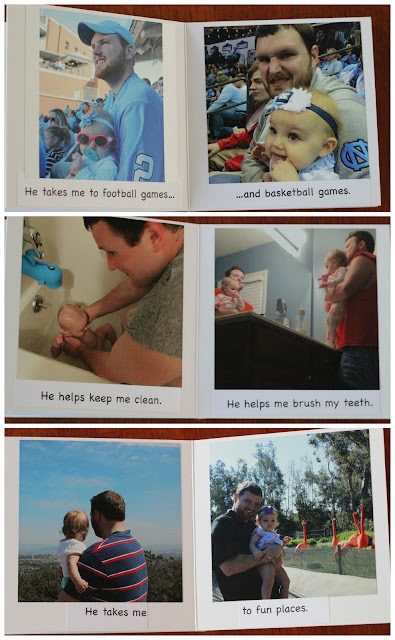 Cut the card stock into strips with each sentence on it. Lay out each page to make sure everything fits/looks right/is in the order you want it. I sprayed the words and glued all of those down first before I glued the pictures. I will say be sure to put newspaper or a sheet down where you are spraying or you will be stuck with sticky adhesive all over your dining room table (whoops...any ideas for getting that off?!). 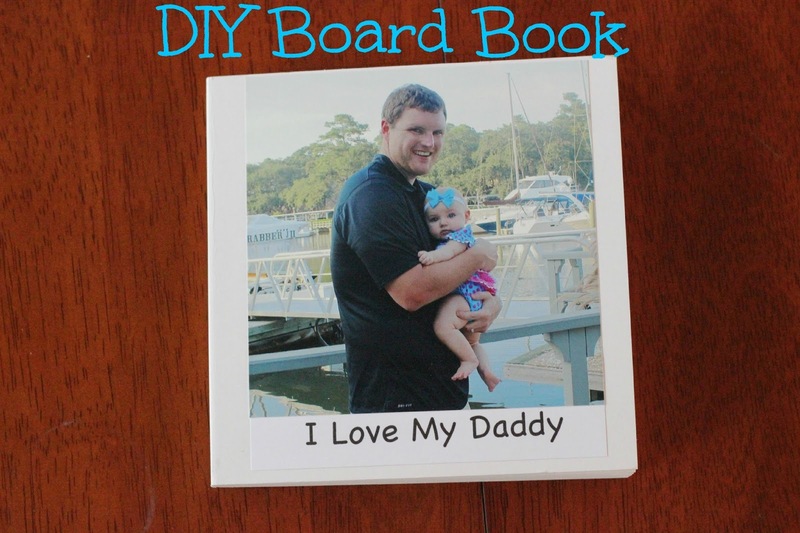 And voila...a fun board book for the dad who hates presents! I'm really happy with how it turned out, and Ella loves to read this book with her dad, just like I predicted! This is SUCH a good idea! I love this because it is so much less expensive than buying one. I need to remember this. It looks like it turned out beautifully. Nice job! This is the sweetest gift! I just love it! !